Autumn is wrapping its cozyness around us, our days are filled with tea, photography, cakes and cinnamon scents. 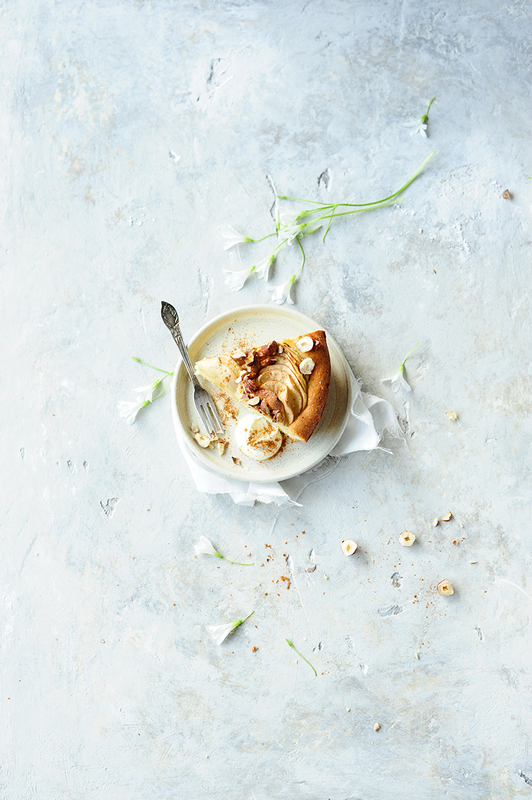 So, it feels like it’s time for apple cakes here, light and fluffy, with hazelnuts and cinnamon on top and comforting whipped cream. Easy to make, delicious, and perfectly fitting for days like these when you don’t want to spend the whole day in the kitchen. 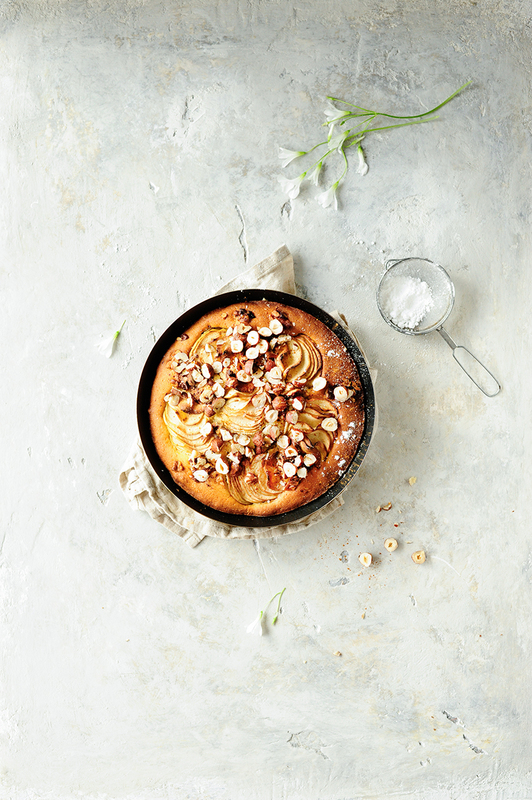 I could not love this classic combo of apples, hazelnuts and fluffy cake more. It’s all I can think of on a Sunday afternoon. Cream the butter and sugar together until the mixture is pale and light. Gradually add the eggs, scraping down the sides of the bowl from time to time. Add the vanilla extract and kefir and mix to combine. Sift the flour and baking powder into the bowl, fold in until the mixture is glossy and smooth. Grease a 22 cm round baking tin with butter and pour the batter. Arrange the apple slices on top of the batter and sprinkle with nuts. Transfer into a preheated oven to 180 C. Bake for 35 – 40 minutes. Absolutely love the flavours in this cake, perfect for Autumn. Your photos are beautiful. Thank you so much! so happy you like it, Cat! I love the feel of these photos, it’s almost like you’re still clinging on to summer a little with the white flowers. THe recipe sounds divine, I’ll have to try this. Thanks Angela! I hope you’ll love it as much! yes, love the apple season. thank you! I’m not sure if I’m out of the loop but this is the first bake I’ve seen with kefir in its ingreedients. Wonderful autumnal flavours. it works like buttermilk, kefir transforms cakes into springy, fluffy and moist treats. :) Have a nice day, Claire! 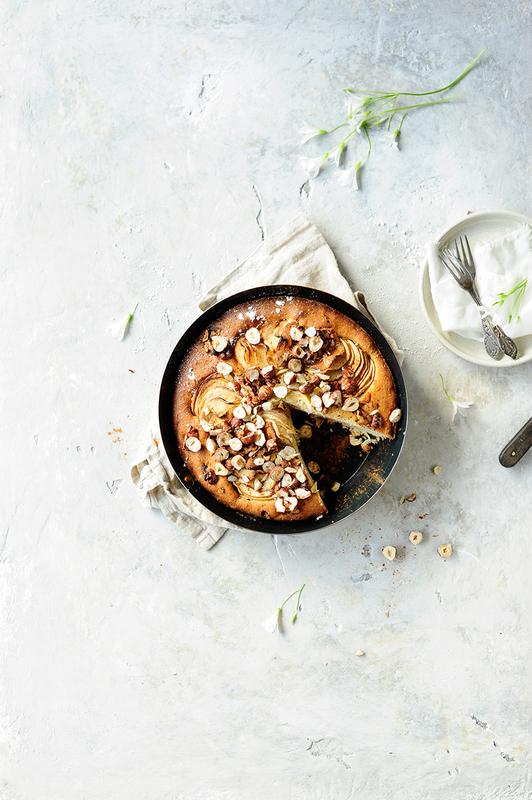 It’s the perfect time for apple cake… And tea! This is such a beautiful cake! Enjoying the little things! Thanks! Absolutely stunning pictures! I adore apple cakes. Autumn is definitely the best season! thanks Nickki, I made this one three times, so delicious. Lovely seasonal recipe- I will use my apples for this !